These Waterloo businesses offer excellent customer service and genuine care for their community. HTC is honored to help them succeed! Lisa and Jay Jones have proudly called Waterloo home for over 30 years. They raised their children here, and now their children and grandchildren all live within a 15-mile radius. When one of the oldest commercial buildings in the heart of downtown became available in 2011, the Jones’ jumped at the opportunity to create a coffee house and restaurant that their family, friends, and entire community could enjoy. From the beginning, Lisa and Jay committed to supporting local businesses. Their menu features salads made with fresh, locally grown organic greens and meats from Monroe County farms as well as staples purchased from a nearby grocery store. Just as the Jones’ choose to buy local for their cafe, they also choose to use communications services from a business that’s been around just as long as their building. HTC’s dependable business Internet service allows them to process credit cards quickly, while our phone service lets them take calls for takeout orders. Knowing a technician is just a call away and around the corner, the couple can focus on keeping customers happy with great food and coffee. Whether you own one precious pup or a whole herd of horses, it can always be scary when your animal is sick or injured. Luckily, the staff at Waterloo Animal Hospital is dedicated to providing the best veterinary medical care to pets and livestock of all sizes. From vaccinations to complicated surgeries, multiple doctors and technicians always work together to share ideas about the best treatment options. Being able to provide modern solutions for preventative care, injuries and illnesses requires ongoing veterinary education and the most state-of-the-art diagnostic equipment. 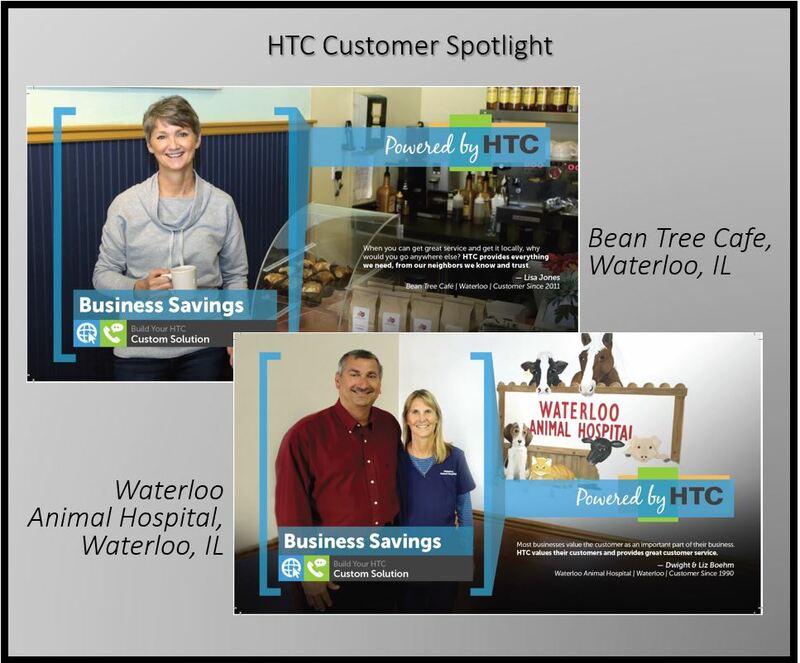 In order to conduct research and discuss important procedures with other experts in the industry, Waterloo Animal Hospital’s staff relies on dependable high-speed Internet and quality phone service from HTC. We’re proud to play a part in the success of so many restaurants, shops, and other businesses around Monroe and Randolph Counties. If you’d like to find out how a local Internet, phone, and TV company can improve your communications with customers and clients, we’d love to talk! Just give us a call at 939-6112.